Students seeking a unique and rewarding academic experience provided by Erie County’s private schools have an exciting opportunity. Cullen Foundation seeks to assist families of high-achieving students to mitigate the financial challenges of attaining a private middle school and high school education through our Cullen Scholars program. Cullen Foundation believes that access to high quality education is critical for an individual and a community’s success. To this end, we are providing an opportunity to a select group of high-performing students entering grades 5 and 9 to attend a private school in the BISON Scholarship Fund or Education Collaborative of WNY networks. Cullen Scholars also participate in Buffalo Prep, which provides access and preparation for talented underrepresented youth to achieve success in college preparatory high schools and higher education. Our program provides access to private schools with preference given to students of color. We offer this opportunity to high-achieving students while increasing the diversity of experience for all private school students. Cullen Scholars will be selected based on academic achievement, financial need and character. Student is in good standing with a “B” or above average. Middle School scholarships - see chart below. 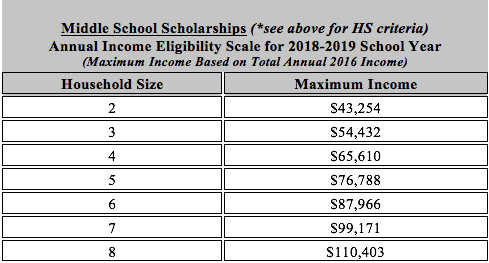 High School scholarships - household income cannot exceed $65,000. Student must be an Erie County resident. Students will be required to participate in Buffalo Prep. Student is nominated by a BISON Fund or EdCo school. Preference is given to students of color. Applications must be completed by a school in the BISON Fund or EdCo network. Applications are to be completed by the school and not by a parent/guardian or student. Each BISON Fund school may nominate one 4th grade student for a middle school scholarship to begin in 5th grade. Each EdCo school may nominate one accepted, incoming 9th grader for a high school scholarship. Scholarships are partial and renewable, contingent on meeting our academic and financial criteria each year. Parents and students will be required to sign a contract that outlines the family’s responsibilities. A committee comprised of community volunteers will review the applications and choose the scholarship winners. The entire application will be online. Schools may click here to login or create a new account. The application process opens November 1, 2017.